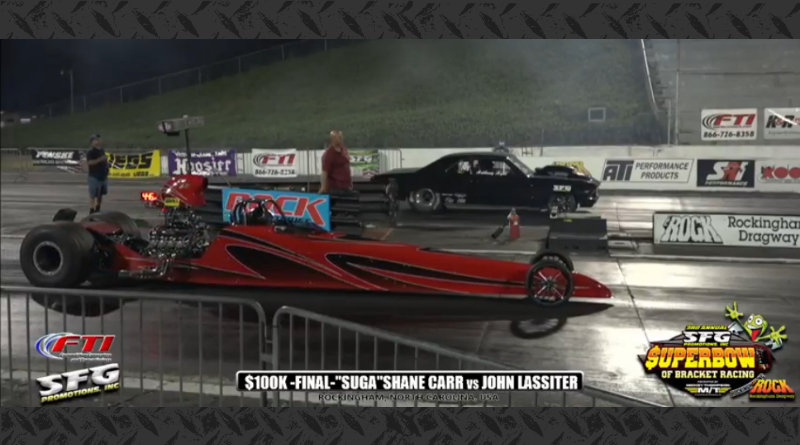 ROCKINGHAM – “Suga” Shane Carr captured the first $100k check of the weekend on Friday night at the SFG Super Bowl of Drag Racing held at the legendary Rockingham Dragway. Carr drove his beautiful dragster to the winner’s circle after defeating a red-lighting John Lassiter and his classic Chevelle in the final round. The semifinals included two dragsters and two door cars. Carr defeated Don Hansen in an all-dragster showdown while Lassiter’s Chevelle took down the Camaro of Jeff Serra. The big dollar payouts continue on Saturday and Sunday as someone will win $100k on each day. With huge car counts, everyone is taking their shot at the big payday! For more results from the SFG Super Bowl of Drag Racing, click to here to view Wednesday’s results, and here for Thursday’s winner. Visit DragChamp daily for the latest big money bracket racing results from the SFG Super Bowl of Drag Racing at the Rock!